The bedrock of any organization is the observance of, and adherence and obedience to its rules and regulations, the absence of which breeds indiscipline and impunity, such as in the ruling All Progressives Congress (APC) in the 2019 election season. Article 2 of the APC constitution states that, “the provisions of this Constitution shall be supreme” subject, of course, to their being consistent with the provisions of the Constitution of the Federal Republic of Nigeria. But what has played out in the APC? Naked abuse of procedures and involvement in anti-party activities. The powerful and mighty have made mincemeat of the supremacy of the party constitution, which provisions guide the conduct of members. 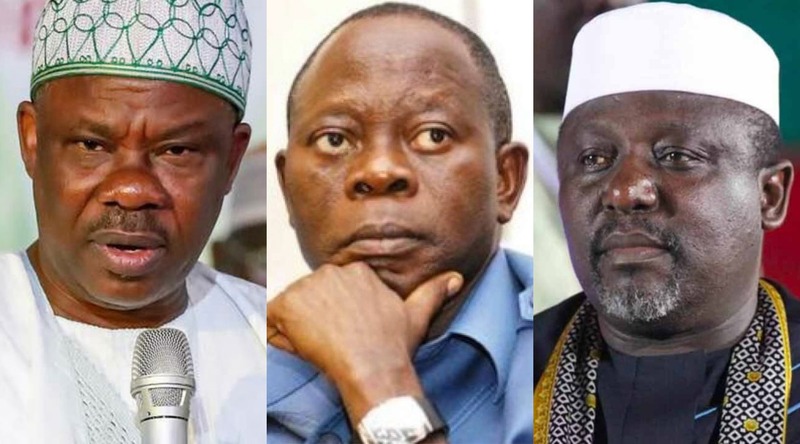 Such are the antics of the Governors of Ogun, Imo and Ondo states, Ibikunle Amosun, Rochas Okorocha and Rotimi Akeredolu – all reportedly engineered the formation of parallel political parties under which they sponsored candidates, and campaigned for them in the February 23 and March 9 polls. Ironically, the governors remain in the APC, and Amosun and Okorocha have secured senatorial tickets at the February 23 election, while their “choice” candidates were or are being elected on the platforms of the Allied Peoples Movement (APM) and Action Alliance (AA). Perhaps, for making a huge show of their infractions, and taunting the APC to do its worst against them, the Comrade Adams Oshiomhole-headed National Working Committee (NWC) lately suspended Amosun and Okorocha from the party. Also suspended are the Minister for Niger Delta Affairs, Usani Uguru Usani, and the Director-General of the Voice of Nigeria (VON), Mr. Osita Okechukwu, while Governor Akeredolu is queried for similar anti-party activities. Besides arguing that Oshiomhole ought to suffer a harsher penalty than the ones served those suspended and/or queried, Okorocha claimed that the NWC has no powers to sanction him without the initiation and recommendation of the executive committee at his ward level of the party. State governors, being the oil that lubricates the engines of their respective political parties, see themselves as not beholden to any authority. And this is the big problem for the APC going forward after the 2019 election: How to break the overbearing powers and influence of its governors and similar party bigwigs! However, by suspending/querying Amosun, Okorocha, Usani, Okechukwu and Akeredolu (the list should have included many other members across the country), the NWC has taken the first step to calling the recalcitrant members to order. Major offences members may commit, as listed in Article 21 of the APC constitution, include: A breach of any provision of the constitution; anti-party activities or any conduct likely to embarrass or have adverse effect on the party or bring the party into hatred, contempt, ridicule or disrepute; and disobedience or negligence in carrying out lawful directives of the party. Others are: Unauthorized publicity of a party dispute without exhausting all avenues for settlement or redress within the party; factionalisation or creating parallel party organs at any level; flouting the rules, regulations and decisions of the party; and filing legal action against the party or any of its officers on any matters relating to the discharge of the duties of the party, without exhausting all avenues for redress in the constitution. The rest are: Alteration of the Delegate lists, falsification of nomination results, and/or tampering with the processes of internal democracy of the party; and any other conduct or act prohibited by the Constitution of the Federal Republic of Nigeria, the Electoral Act, Electoral Guidelines or which, by the rules and regulations of the party, constitutes an offence. Is there any of these infractions that Governors Okorocha, Amosun and Akeredolu, and Messrs Usani and Okechukwu didn’t commit directly or encourage others to commit against the APC? The party, considering “the nature and gravity of an offence,” has power to mete out any sanctions that include: Reprimand; censure; fine; debarment from holding party office; removal from party office; suspension from the party; expulsion from the party; debarment from contesting party office; and, in appropriate circumstances, cause the prosecution of a member or erstwhile member of the party concerned. The sticking point, though, is whether the NWC followed the procedures to arrive at its decision to suspend and/or query the offenders, as raised by Governor Okorocha? Under Article 21 of its constitution, the APC adjudicatory bodies over complaints and allegations are located in the executive committees at the polling unit, ward, local government area, state, zonal and national levels of the party. Accordingly, the procedure for the hearing and determination of complaints or allegations is: A complaint by any member of the party against a public office holder, elected or appointed, or another member or against a party organ or officer of the party “shall be submitted to the executive committee of the party at all levels concerned,” which shall within seven days appoint a fact-finding or disciplinary committee to examine the matter. And the National Executive Committee shall, on receipt of the report of the fact-finding committee, make a decision on the matter within fourteen (14) days. If it didn’t, the APC should comply with these procedures, as some or all of the said offending members deserved their punishments, and even “automatic expulsion” for filing court actions against the party. Discipline must be entrenched, and maintained henceforth, and uncontrollable members should exit or be thrown out!